At Sheehan, Barnett, Dean, Pennington, Dexter & Tucker, P.S.C., we have served Danville and the neighboring areas of Kentucky for more than 40 years. As a general practice firm, our attorneys offer comprehensive guidance to individuals, businesses and families for almost any legal matter. We are a small-town law firm, and we are proud of that fact. Many of our attorneys are from the Danville area, and we all chose to come home to be of service to our community and to raise our families here. Being a small-town firm, however, does not mean we don't have what it takes to get results for our clients. With more than 100 years of combined experience, our lawyers are skilled litigators and negotiators who are willing to fight to protect your best interests. Whether you are going through a divorce, have been charged with a crime or need a sound business plan, we are here to help. Our Door Is Always Open. Get Started Today. You don't need to go far to find effective legal guidance. 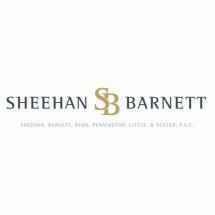 At Sheehan, Barnett, Dean, Pennington, Little & Dexter, P.S.C., you can find the counsel you need just down the street. Call us today at 859-965-1072 to arrange a time to meet your attorney.